Marina Del Rey Wedding Photos capture scenes of a New York event that seem like they could have been taken in a location much further away. The Marina Del Rey is a venue in the Bronx, that has the ambiance of a Mediterranean villa, with the breath-taking views of the New York City skyline. 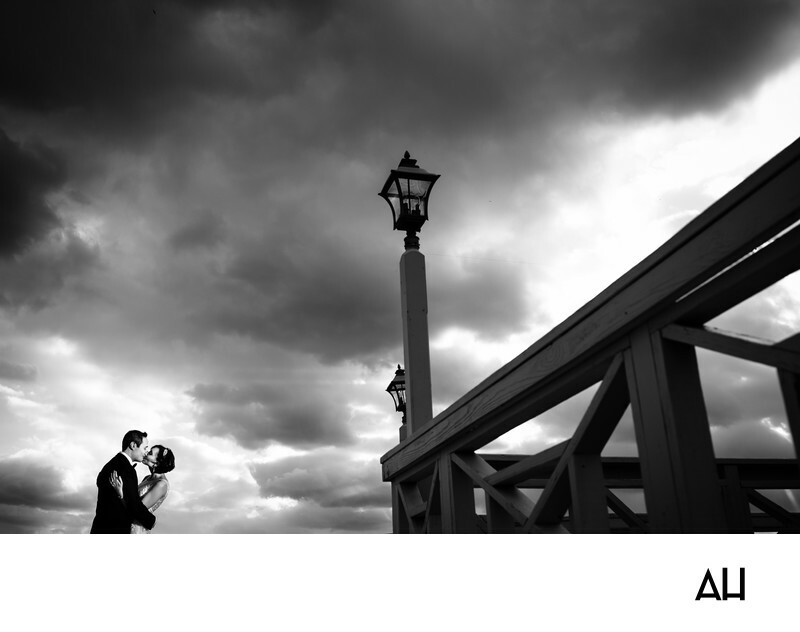 In this image from a collection of Marina Del Rey Wedding Photos, the bride and groom stand before a cloud painted evening sky. The photo is colored in black and white, adding to the dramatic atmosphere of the scene. In the right of the picture, lanterns overlook the Hudson River from a wooden porch. The lanterns remain unlit for now, but they will begin to glow as the sun goes down. The river is not seen in the image, but the couple stand before it as they embrace in the left. With only the expanse of sky and the empty porch seen in the photo, it looks as though the couple could be the only two people left in the world. The newlyweds share a kiss as sunlight peeks through the clouds and creates a lightness around them. It looks like a scene from an old movie, with the groom in his tuxedo and the bride stunning in a beaded headpiece and her glamourous gown. It could be the final scene of a love story, with the bride and groom finally coming together in love as the sun sets in the clouds behind them. For this couple though, this day is really the beginning of their story, with years of love and happiness ahead for them to look forward to.